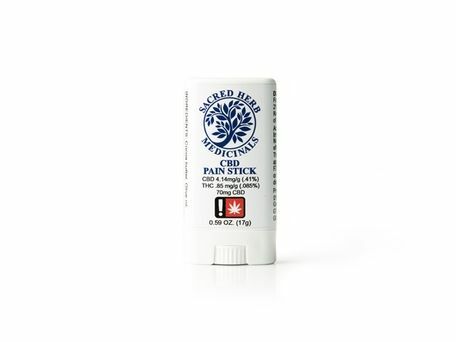 Sacred Herbs flagship anti-inflammatory CBD pain stick! Made from a blend of fifteen different herbs, essential oils, waxes and butters, it can be applied to any skin area. Great for irritated and sore muscles, bumps and bruises. With the easy to use hands-free applicator it is perfect for people on the go like musicians or athletes. Just throw it in your bag; melts on your skin, not in your pocket! Ingredients: Cocoa butter, Beeswax, Olive oil, Avocado oil, Jojoba oil, Cinnamon, Comfrey, Rosemary, Arnica, Pepper, cannabis flower, Camphor oil, Peppermint oil, Lavender oil.